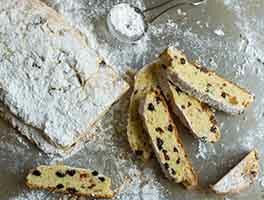 The classic Christmas stollen is made with yeast. But we think this quicker, easier gluten-free version, made with baking powder, is just as tasty. Filled with dried fruit and toasted almonds, and covered with a thick layer of butter and sugar, this pastry is delicious with coffee or tea. Preheat your oven to 325°F. Lightly grease a baking sheet, or line it with parchment. Whisk together the flour, sugar, baking powder, salt, and xanthan gum in a mixing bowl. Cut the cold butter into small chunks, then blend it into the flour mixture to form uneven crumbs. In a separate bowl, mix together the cheese, eggs, vanilla, and flavors. Toss the fruit and almonds with the flour mixture until evenly distributed. Then combine the wet and dry ingredients, mixing until most of the flour is moistened. Turn the dough out onto a lightly floured work surface, and knead it two or three times, until it holds together. Divide it in half. Pat each piece of dough into an 8" x 7" oval about 1/2" thick. Fold each piece of dough roughly in half, leaving the edge of the top half about 1/2" short of the edge of the bottom half. Should you fold the long way, or the short way? The long way will give you a longer, narrower stollen, with shorter slices; folding the short way will give you a wider, fatter stollen, with longer slices. Use the edge of your hand to press the dough to seal about 1" in back of the open edge; this will make the traditional stollen shape. 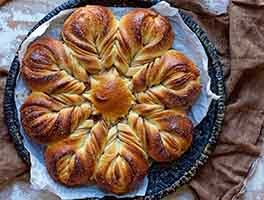 It's also the familiar Parker House roll shape, if you've ever made them. The dough will probably crack; that's OK, just smooth it out as best you can. Carefully place the shaped stollen on the prepared baking sheet. Bake the stollen until they're very lightly browned around the edges and on top, about 40 minutes. A cake tester inserted into the center should come out clean. Remove the stollen from the oven, and transfer them to a rack. Brush them each with 2 tablespoons melted butter. Sprinkle heavily with confectioners' sugar. Allow the stollen to cool, then brush with butter again, and sprinkle with sugar again. Wrap in plastic wrap until ready to serve; serve within a week. If desired, sprinkle with additional sugar just before serving. Yield: two 1-pound stollen loaves. Check your ingredients to make sure they're all gluten-free. Gluten can turn up in some unexpected places, so it's important to read labels when you're baking for someone who's trying to avoid it. Best stollen ever and I didn't miss the yeast. I added 1/4 tsp lemon extract and I put a Tbsp of brandy in my dried fruits. 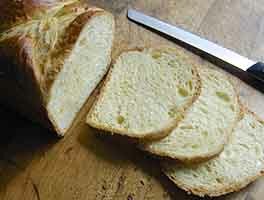 Skipped second buttering of breads. Just sprinkled on more sugar. The texture is excellent and the flavor outstanding. Super easy too! Fast and easy to make. I omitted the butterfly stuff, I believe in trying to use natural ingredients as much as possible. Did add some home made almond paste in the middle, and instead of brushing with melted butter alone, I mixed in some rum, that's what my father always did, and why waste a good tradition. This recipe is DELICIOUS! I've tried a couple of other recipes but this one was the best by far. It is so good! We made it with the buttery flavoring so I'm not sure how it tastes without it. I definitely recommend this recipe to anyone who wants a delicious, sweet bread. YUM! Thank you, King Arthur Flour for this recipe! Sensational! Hands down, no contest best gf stollen recipe I have ever made (and I have tried many!). Melt-in-your-mouth buttery on the surface with a flakey sweet interior. Lovely! I baked this last year with my daughter-in-law and granddaughter, who cannot eat gluten. We made the mistake of using a different brand of flour, and the dough was so stiff that we had to keep adding milk. Nevertheless, the stollen turned out beautifully, and we all loved it. The taste and texture were great. We used the buttery sweet dough flavoring, but I don't think it was necessary. We also placed a 1-inch roll of marzipan on the dough before folding it over. My DIL had tried other gluten free stollen recipes using yeast, and they turned out badly. We were all so happy that we could once again have stollen for Christmas brunch. This year we will make it again, but use King Arthur flour. I am over 60 years old. Since I was little girl we have always had Stollen for Christmas morning breakfast. My mother made the Stollen and I have carried on the tradition for my children. Recently my youngest daughter has gone gluten free and was moaning the fact of no Stollen this year. I have made this Stollen recipe today. It was easy to follow directions. The taste is awesome and looks great. She stopped over we just had a sample and can't wait till Christmas morning for more. Thank you so much for sharing the recipe. I will definitely be making again. Hi , I have had the pleasure of having gone to Germany MANY times. My in-laws are german. We are newly Celiac since a few months. This recipe is awesome. I bake a lot. The stollen was very flaky and dense. My husband is a very picky eater and he told me this was one of the best stollen he ever has had. when the bred is hot out of oven . I pocked holes in it with a stick. Then I brushed melted butter over it , then the icing sugar , I did this twice. It gives the bread a very pronounced butter taste. I did this because I did not use the buttery sweet dough flavor. But I did get a good quality lemon extract(oil) and added it. I put pecans instead of almonds . its a great recipe and very easy to do. I made this recipe yesterday and it is FABULOUS!! I added Marzipan to the center before folding in half---so yummy! Thanks for giving me the option to enjoy this! Wow!! This was beyond excellent. I had high hopes especially since I've never had regular stollen so I knew I couldn't compare it and be disappointed. I halved the recipebecause I don't want to waste my ingredients in case this wasn't edible. Well now I wish I'd made both! Excellent flavor and texture. Perfect to pair with a cup of tea. This is one that will not disappoint ! I'm thinking it would make excellent cookies just dropped by the spoonful too. 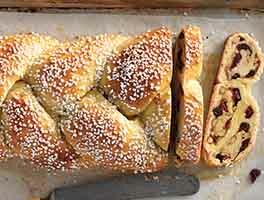 Stollen is perfectly suited for a gluten-free conversion because it is a dense bread. 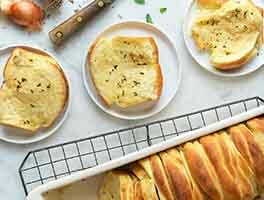 This recipe is so easy and the results are delicious.